Fox Bros. BBQ is recognized throughout the South as one of the premier BBQ destinations in Georgia. This Atlanta joint is quickly gaining fame for their mix of sweet Southern "Q" with a spicy, Texas influence. 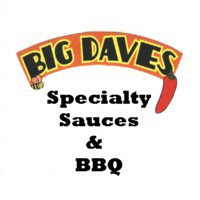 In response to customer demand, Fox Bros. now sells their signature BBQ and Wing sauces in local supermarkets and online at www.snazzygourmet.com. Fox Bros. Wing Sauce is packaged in 16 oz glass bottles. The packaging is pretty standard and the label a bit uninspiring. The dark red sauce is on the thin side and pours quickly from the large mouth of the bottle. As I mentioned, Fox Bros. is known for blending sweet with heat. That's exactly what makes Fox Bros. Wing Sauce so unique (and delicious). While a standard wing sauce typically relies completely on a vinegar and chili pepper blend for flavor, Fox Bros. builds on that base with tomato paste and sweeteners. The result is what amounts to a BBQ / Pepper Sauce hybrid that is just the right balance of each. I first used Fox Bros. Wing Sauce on a rack of ribs. I brushed a few coats of the thin sauce on a rack of baby backs as they finished cooking. There was just enough sugar in the sauce for it to caramelize and darken under the heat. The sweet and spicy blend was really outstanding on the bones. Though it didn't create the bright, glossy shine that I typically look for on ribs, it was easy to overlook because the flavor was so good. Though I was tempted to use the entire bottle on ribs, I reserved half of it for its intended use. Super Sunday provided the perfect opportunity to cook wings. I warmed up the sauce to bring out the sweetness and take the chill off. I then tossed a couple dozen hot out of the oven wings in the sauce just before serving. Drenched in sauce, the wings were pretty spicy. I kept a glass of milk within reach to occasionally douse the flames. The heat didn't stop my wife and I from devouring all the wings in a matter of minutes. Fox Bros. Wing Sauce may break with Buffalo tradition, but folks in Atlanta don't seem to mind. The can also count me a new fan of their product. I love the added sweet element that Fox Bros. features. In my opinion it really elevates the sauce above most other wing sauces. This bottle of sauce has solidified Fox Bros. as one of my "must visit" BBQ joints next time I'm in the South. Note: Samples of this product were provided by Snazzy Gourmet. Check out www.snazzygourmet.com to purchase Fox Bros. products or any of their other gourmet sauces, marinades, rubs and snacks. 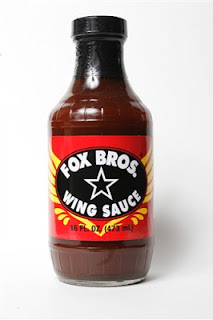 Be sure to click our "Product Reviews" page to see Fox Bros. Wing Sauce's star rating. 0 Response to "Fox Bros. Wing Sauce"